The raphe nuclei (Latin: raphe = 'seam'; nuclei = cell 'clusters'; pronounced RAY-fee) are a moderate-size cluster of nuclei found in the pons part of the hindbrain portion of the brain stem. Their main function is to release serotonin to the rest of the brain. Selective serotonin reuptake inhibitor (SSRI) antidepressants are believed to act in these nuclei, as well as at their targets. The raphe nuclei are traditionally considered to be the medial portion of the reticular formation, and they appear as a ridge of cells in the center and most medial portion of the brain stem. All of these nuclei have fascinating interactions with almost every pertinent portion of the brain, but only a few of them have specifically independent interaction worth exploring in their own right. These select nuclei are discussed as follows. Overall, the caudal raphe nuclei, including the raphe magnus, pallidus and raphe obscurus, all project towards the spinal cord and brain stem. The more-rostral nuclei, including the raphe pontis, centralis (also called median), dorsal, tend to project towards the brain areas of higher function. 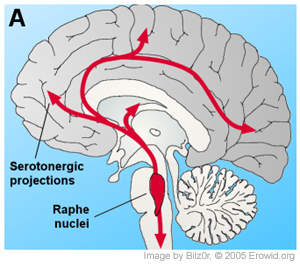 The 7 raphe nuclei receive afferent connections from some of the most fascinating spots in the brain, only to project back to them and alter their processes. The raphe nuclei have a vast impact upon the central nervous system. The raphe nuclei can be of particular interest to neurologists and psychologists since many of the neurons in the nuclei (but not the majority) are serotonergic, i.e., contain serotonin - a type of monoamine neurotransmitter. Serotonin, also called 5-HT, seems to be the culprit in many of our modern psycho-pharmaceutical problems, such as anorexia, depression, and sleep disorders. It is not the sole culprit in the aforementioned disorders, but it is the area that the pharmacologists know how to affect in the best manner. It is important to note that pharmacology traditionally affects global serotonin levels, while the actions of the raphe nuclei are dependent on the complex interplay between nuclei. Projections from the raphe nuclei also terminate in the dorsal horn of spinal gray matter where they regulate the release of enkephalins, which inhibit pain sensation. Currie, David (2005). A Lecture, Higher Brain Function: Activation of the Brain and Levels of Consciousness. East Tennessee State University. Sari, Youssef (October 2004). Serotonin1B receptors: from protein to physiological function and behavior. Neuroscience & Biobehavioral Reviews 28 (6): 565–582. ↑ (1999) "Understanding the neuroanatomical organization of serotonergic cells in brain provides insight into the functions of this neurotransmitter" George J. Siegel Basic Neurochemistry, Bernard W. Agranoff, Stephen K. Fisher, R. Wayne Albers, Michael D. Uhler, Sixth, Lippincott Williams and Wilkins. ISBN 0-397-51820-X. "In 1964, Dahlstrom and Fuxe (discussed in ), using the Falck-Hillarp technique of histofluorescence, observed that the majority of serotonergic soma are found in cell body groups, which previously had been designated as the raphe nuclei." ↑ Briley, M (October 1993). Neurobiological mechanisms involved in antidepressant therapies. Clin Neuropharmacol 16 (5): 387–400. ↑ BilZ0r, Erowid (2005). Figure 4. Diagram of the human brain showing the divergent serotonergic projections of the raphe nuclei to both cortical and subcortical locations throughout the brain.. (PNG) The Neuropharmacology of Hallucinogens: a technical overview. Erowid Pharmacology Vaults.